Some pioneers in the cannabis industry have flown under the radar long enough that they still survive to this day. There are even fewer that have maintained the reputation of a legend. And there is only one who has an exhibit currently at an art gallery in Los Angeles displaying cannabis botany and culture for over 40 years and you have a chance to see it now through June 9th. Mel Frank is the Godfather of Growers. Mel Frank is a true Legend. Mel didn't plan on being a writer or a photographer, but his deep passion for growing cannabis wrote the history. In 1971, Mel's writing first showed up in Rolling Stone on the one subject closest to his heart: growing cannabis. 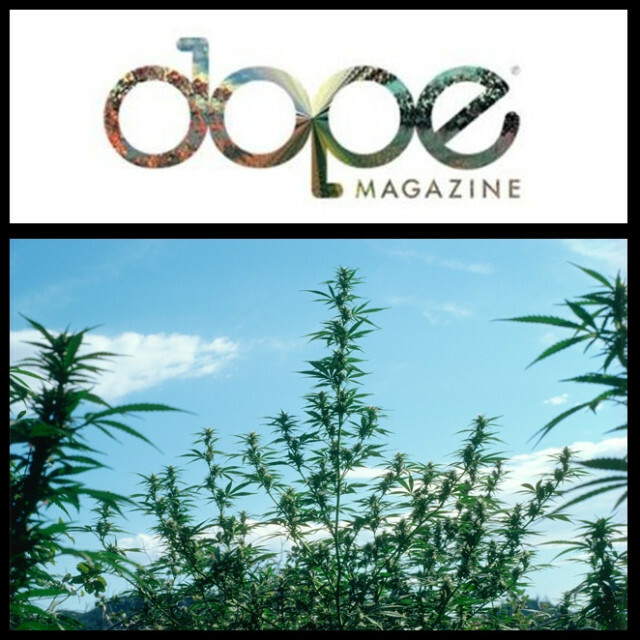 In 1975, a year after the first issue launched, a little rag named High Times swooped up Mel and he not only found himself submitting cannabis photos, he also became the first person to answer grow questions for the magazine. And here you thought it was Ed Rosenthal who first answered grow questions. Well, it's funny you bring up Ed, because Ed and Mel not only wrote one of the most researched books on cannabis ever published, "The Marijuana Growers Guide Deluxe" (1978), they also bought a house together. While Ed was in the spotlight, Mel was in the closet… growing and breeding. In fact, if you've smoked any cannabis in California since the '80s, and it wasn't Mexican weed, there's no doubt those seeds that produced the sinsemilla were designed by Mel Frank. One breed that Mel fine-tuned is still known today as Durban Poison. DOPE: Mel, after 40 years of photography, is "When We Were Criminals" solo exhibit really your first gallery show? Mel Frank: Well, [light giggles] sure. Who would be showing stuff like this? And making actual art prints. Mostly they've just been seen as jpgs in magazines. And when I've given lectures. D: Were you the first to use a microscope on buds? MF: I was the first to do color micrographs of the resin glands, yes. Actually the red one in the show, the sinsemilla tip, that was the first photo-micrograph that I took and it came out perfectly. And I was guessing on the time of exposure, all that stuff. D: Wow. That's… talk about a great experiment! That's incredible. Now with the industry the way it is now, do you hit the festivals, events and things like that? I know Ed is out there a bunch. MF: Ed's out there all the time. Ed, in our relationship, with writing the book and owning the house, Ed was always out there. Any event, rally, or anything else, Ed would be out there up on the stage yelling and screaming, you know. And I was the opposite, nobody knew who I was, kind of in the background keeping quiet. Just growing the plants and doing all that stuff. MF: Actually, in one of my photographs someone is wearing a t-shirt that says "FREEDOM IS THE ISSUE." Ed had those made up. That was at a rally, I think Harvey Milk was there, Dennis Peron, I knew from San Francisco, not close but you know we knew each other. He had a veggie cafe, but mostly they were selling marijuana. You know, they would bring you a kilo between ordering you dinner… [everyone is rolling with laughter]. D: Now, you're a master breeder. Durban Poison, that's your creation. That's you! MF: Durban was me, yes. D: That's still one of the most popular strains. D: Now was anyone doing indoor before you? MF: You know, I don't know. No one was talking about it if they were. D: You were growing indoor on the East Coast. Did you start playing with hours? Did you know about light cycles? MF: At first I had it [lights ]on, I think about 16 hours a day, and they didn't flower. [Months went by] and finally the males started to flower and it was probably November or something, and I'm looking outside and it's dark, so finally I just turned the lights down to 13 or 14 hours and the females flowered. Then I knew it was the light. D: Were you ever a clone guy or were you just seeds? MF: I knew how to clone and I wrote about it in The Deluxe. I basically said in the first edition that you could make clones out of this. You can make cuttings. D: I don't think anyone had ever said that before you! So, what's the biggest mistake that growers make, that could easily be avoided? MF: [Laughter] Oh, I'll tell you what one of the worst things is: FLUSHING. Totally useless and wasteful. MF: Totally, totally ridiculous. I don't know who came up with this concept, it does nothing…You know what I did, I always stopped fertilizing altogether two to four weeks before harvest. Also, potassium. If I gave them anything it would be potassium. It turns out the plant takes up a lot of potassium at the end. A lot more than phosphorus. It also uses a lot of calcium right at the beginning. With his robust photo archives, we all want to know, is there a coffee table book in the future for Mel? "Well I've thought about doing that for a long time, but I don't have it in the works." Well, Mel, there's no better time than the present. You've planted that seed, and we all want to see it grow. Don't miss out on a once in a lifetime experience to view these legendary photos by Mel Frank at his debut solo exhibit, "When We Were Criminals" now through June 9, 2018 in Los Angeles.